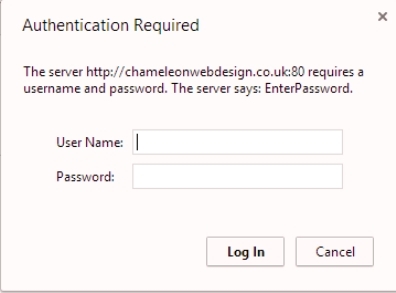 If you are looking for a way to password protect a folder or file on your website, maybe for demo sites or building a new website as work is in progress then you can use a .htaccess file to control the access availability. This is obviously if the server allows this, most web servers will. This works by blocking access unless a username and password is provided. You need to change the “testuser” with the name you require. The password shown here is “password” encrypted to “80KN95Q9e5YXc”. Change the filename to specific file you are looking to protect, in this example it would protect the homepage of any website using index.php such as WordPress. You need to also change the path the password file. If you do not do this you might not be able to access the website or get an error. Now upload into the directory where you are storing the password. Obviously replace the ???? with the folder name where you are storing the password. 1. Create “.htpasswd” with username and password. 3. Identify the full path to the “.htpasswd” file. 5. Add the related security code specifying the full path to the “.htpasswd” file and the protected files. You will need something like notepad to generate the files required and if your operating system is not letting you work with “.” then simply create the files “htaccess.txt” then upload via FTP and rename. Go to the specified area of the website you are looking to protect and you should get a pop up with username and password. If you are looking for an MD5 Hash Password Generator then click here.